The first Friday in June is National Doughnut Day celebrating the doughnut, an edible, ring shaped piece of dough which is deep-fried and sweetened. This holiday event began in 1938 as a Chicago Salvation Army fundraiser for much needed funds during the depression. The day also recognized special women known as "Doughnut Lassies" who made and served doughnuts to homesick WWI soldiers in France, since doughnuts were thought to be the quintessential American food. 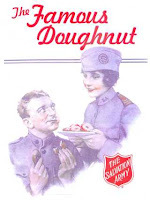 Here's a song from a 1918 songbook celebr ating doughnuts in WWI. The history of donuts, like so many foods, is debatable. Some believe that Dutch settlers brought doughnut making techniques from Holland. Hostess Donuts were first launched in the 1930's at a time in our history were looking for inexpensive ways to treat themselves. America's favorite doughnut is glazed, followed by chocolate, powdered sugar and plain. There are 10 billion donuts made every year. For a wonderful entry about Donut Day, you'll want to go to: Months of Edible Celebrations' website. Not only is there a great discussion of the history, but Months of Edible Celebrations includes recipes from The Donut Book by Sally Levitt Steinberg, granddaughter of Adolph Levitt, the inventor of the first doughnut machine (1920). As Louise says in her entry, "Sally brings the doughnut to life." You've got to read this. And it may not be too late today to sample some Free Donuts at your favorite donut shop. Check here. I love this recipe from King Arthur Flour. It always works, and it's easy since you can bake these. The donuts come out moist, dense, and dark. Icing is optional, but if you're a true chocoholic, you'll want to ice these donuts and add chocolate sprinkles. That makes it quadruple chocolate! Preheat oven to 350°F. Lightly grease the wells of two standard doughnut pans. If you don't have two pans, simply bake the batter in two batches. In large mixing bowl, whisk together cocoa, flour, sugar, baking powder, espresso powder, baking soda, salt, and chocolate chips. Set aside. In large measuring cup or medium-sized mixing bowl, whisk together eggs, milk, vanilla, and vinegar. You may notice some curdling of the milk; that's OK. Add wet ingredients, along with melted butter or vegetable oil, to dry ingredients, stirring to blend; there's no need to beat batter, just make sure everything is well-combined. Spoon batter into prepared pan(s), filling between 3/4 and full. Bake doughnuts for 12 to 15 minutes, or until toothpick inserted into center of one comes out clean. Remove doughnuts from oven, and after 30 seconds or so, loosen their edges, turn pan upside down over rack, and gently let doughnuts fall onto the rack. For sugar-coated doughnuts, immediately shake doughnuts in 1 tablespoon granulated sugar; add 1/2 teaspoon cocoa powder to sugar for an additional touch of chocolate. If you want to ice doughnuts rather than shake in sugar, allow to cool completely before icing. Combine chocolate chips and milk or half & half in microwave-safe bowl or measuring cup. Heat until half & half is steaming and starting to bubble. Remove from microwave, and stir until chips have melted and icing is smooth. Dip top of each doughnut in the icing; or spread icing on doughnuts.